AdCenter Indoor Series: Easy advertising, right from your windows! The AdCenter Indoor Series, AdChoice LED Signs’ indoor electronic message centers (EMCs), captures the attention and the business of customers. The Ultra HD Full Color LED Display is easily hung behind glass windows or on walls. 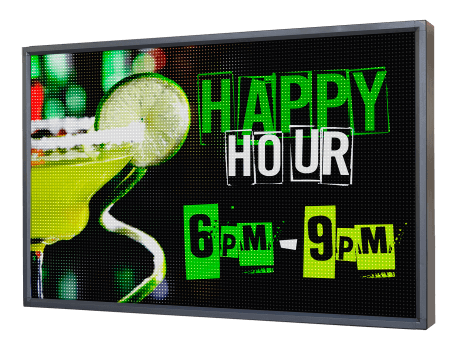 The AdCenter Indoor EMCs are fully programmable LED signs, and are incredibly user-friendly and customizable. They are easily programmed through a PC interface with our proprietary digital sign software, iCreate. Your indoor LED sign by AdChoice will allow you to send messages to both customers outside your business and those already within. Fill your indoor LED screen with messages of great sales and exciting new products. AdChoice’s indoor LED displays are a dynamic, high-quality way of drawing customers into your business and keeping them there. The future of window advertising has arrived, and it is our indoor LED programmable signs! Height x Length 17.5" x 42.5"
Height x Length 22.5" x 42.5"
Height x Length 27.5" x 42.5"